Foliage: Alternate, deciduous leaves, 1.5" to 4" long and 1" to 2" wide; obovate shape with acute to accuminate tip.Serrate leaf margins (toothed). 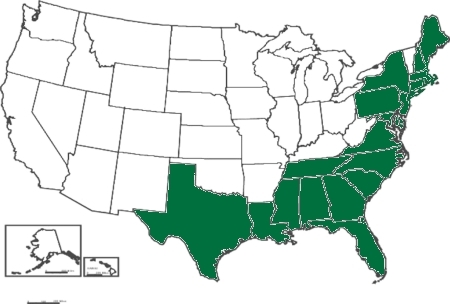 Green to dark green color. Late to leaf out in spring. Autumn foliage is yellow-green to brown. Buds with loose scales, the terminal is much larger than the laterals; leaf scar with one bundle scar. Often root suckers to form colony-like thickets. Flower: white, numerous, small white flowers held in racemes that are 3" to 5" long and 3/4" wide. Individual flowers are 1/4" across. Blooms are found on new season's growth. Range in New Jersey: Frequent or common throughout the district, occuring to the north, mainly on the coastal plain. Misc. USDA lists as FAC+, meaning facultative; equally likely to occur in wetlands or non-wetlands (estimated probability 34%-66%). Stone (1911) says "This is a characteristic shrub of all the swamps of the coastal plain. Its fragrance fills the air after the somewhat similar odor of the swamp Magnolia of early summer has passed away, while its handsome white flower spikes furnish a touch of color at a time when few other shrubs are in bloom." 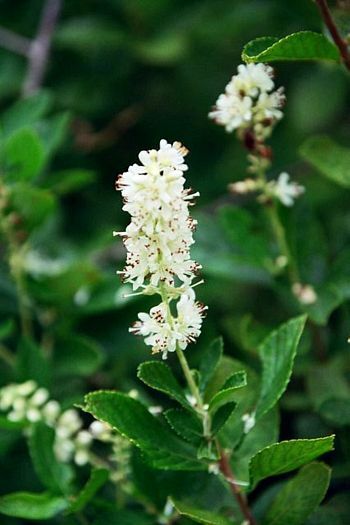 "At Manahawkin it is called Soap Bush, from the idea that the flowers when rubbed together in water make a sort of soapy lather. Our results have not been very startling, however." Often found with blueberries and swamp azaelas. Used in landscaping; flowers attracts bees, butterflies, and hummingbirds; fruit attracts birds. Prefers acidic soil. Clethra is the only genus in the family, Clethraceae, which is very closely related to the heath family, Ericaceae. Sometimes confused with Itea virginica. 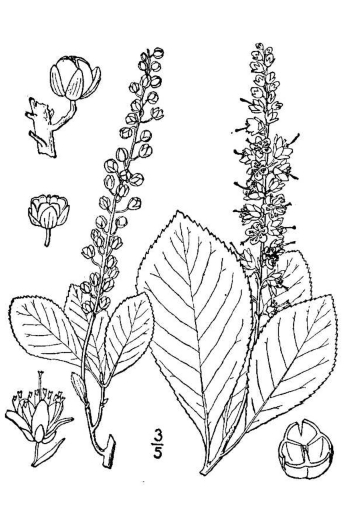 Clethra, Greek word for alder (which has similar leaves); alnifolia, alder leaf.